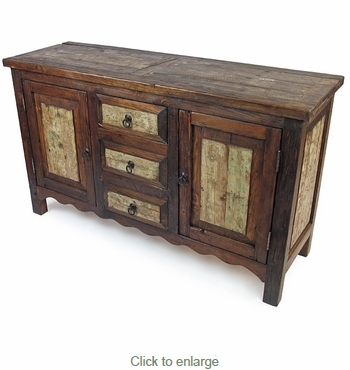 This old wood sideboard with 2 doors and three drawers is right at home in any southwest, ranch or Mexican hacienda style dining or kitchen. The side panels, doors and drawers are accented with weathered whitewashed paint to create a unique piece for your home. This buffet has plenty of storage for flatware, linens and more. The skilled craftsman in Mexico create these unique sideboards with the texture and character from Spanish colonial times. Note: Expect variations in grain texture and finish in these one-of-a-kind sideboards.